If you are looking for a summer cap off event, visit downtown Auburn, NY located in the heart of the Finger Lakes Region, the second weekend in September. TomatoFest is a two-day street festival that offers something for the whole family, whether you like all genres of live music, good food or fine art, TomatoFest in Auburn, NY can provide what you are looking for. Here is a run-down of all of the different offerings happening during that weekend. The live music starts on Friday, September 9th with the TomatoFest kick-off party at Music on the Mall from 7 – 10PM in the State Street Band Shell. This outdoor performance is by Mosaic Foundation whose members include Foli Yao Augustine (Cha Cha) - vocals, percussion; Aaron Sprague – bass; J.P. Nawn - drums, vocals; Ken Luk - guitar, melodica, keyboards, vocals; Kingsley Pipim – percussion; Michael Corey – guitar; Zach Dumrese - sound/dub; and Mark Snowden – keyboards. This reggae band based out of Ithaca, NY blends roots, ska, dub, dance-hall & beyond. Their lyrics inspire dancing, and their songs encourage positivity, sustainable living & community. TomatoFest music offerings also expand inside at a wide range of downtown bars & restaurants on Friday night including Moro’s Table, Prison City Pub & Brewery, Moondog’s Lounge, Osteria Salina and A.T. Walley’s with performance times from 7PM – Midnight. 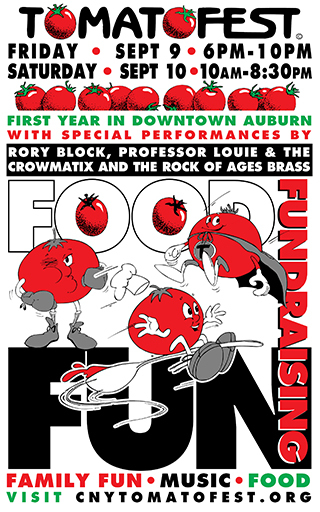 On Saturday, there are over 50 free performances planned for TomatoFest, plus a very special ticketed benefit concert on Saturday night at Auburn Public Theater at 8PM featuring Rory Block and Professor Louie and the Crowmatix and the Rock of Ages Brass Section. From 11AM - 8:30PM on Saturday, there will be 25 musicians playing acoustically in 4 different locations on Genesee Street, mixed in among 30+ craft & food vendors. Plus music on the showmobile stage on Exchange Street Plaza, inside the Genesee Center, under the State Street Band Shell and inside on both stages at Auburn Public Theater. Genesee Center will be filled with lots of family fun activities including face painting, Bubbles, Juggles & Mime, play dough making, a special children’s Tomato Parade and the famous cake cutting by Wegmans to add to the fun. Plus dance demonstrations at APT Dance Studio and Reptile Rescue & puppet shows will be offered on APT Stage Right. TomatoFest food vendors will be serving gourmet egg rolls, lettuce wraps & poutine fries, tomato basil wood-fired pizza, eggplant parmesan, summer pasta, chicken gizzards, tomato pie, focaccia bread & meatballs & more. Make sure and save room for dessert, locally-based Cayuga Lake Creamery will be serving tomato ice cream. If having fun isn’t reason enough to come, proceeds from TomatoFest continue to support the food pantries in Cayuga County, as they have for their 31-year history of the festival. For more info please visit: http://www.cnytomatofest.org/. Jesse Kline is Assistant Director of the Downtown Auburn Business Improvement District, handling event planning, marketing & promotion for the organization.